REDSTONE ARSENAL, Ala. -- Maintaining the U.S. Army's top priorities requires rapid response and solutions. When it was discovered that a loss of aircraft performance and reduced service life on dynamic components of the UH-60M Black Hawk helicopter fleet was the result of a specialized coating on the main rotor blades, the Army required that coating be removed as quickly as possible to maintain functionality of the aircraft. The U.S. Army Research, Development, and Engineering Command's Aviation and Missile Center began working on the project in January 2013. The center's Engineering Directorate Prototype Integration Facility teamed with the Utility Helicopter Program Management Office and the Aviation Engineering Directorate to provide a rapid solution. Together the team developed a method of removal that would cause no damage to the blade structure while effectively removing the coating. The original intention of the Hontek coating was to provide protection of the blades against erosion that happens naturally in sandy environments. As the top sacrificial layer of Hontek degrades, the roughness creates additional drag as the air passes around the rotor blade to create lift. Combine that roughness with the additional weight added to the MRB and the total efficiency of the rotor system is reduced. "The amount of lift you get out of that blade is less, so you can carry less people, you can carry less load," said Allen Waldran, PIF mission assurance manager. "It adds stress on everything that makes the rotor blade go through the air." The coating goes on in three layers. "The top layer could be repaired, so every four to five flight hours in a desert environment, they had to repair [it]. [This] was a big maintenance problem," said Karl Ebert, who provided PIF technical support on the program. This issue, along with loss of performance, proved too costly and inefficient for the Army. The team settled on using a touch labor solution to remove the Hontek. MRBs inducted into the removal process received an initial 100% inspection to determine the condition of the blade and repairs required. HONTEK removal consisted of hand scraping the leading edge of the MRB and the use of specialized tools to remove the bulk of the coating. The final step required use of orbital sanders to remove the final layer. "The advantage of using skilled personnel is to ensure the removal process did not damage the rotor blade skin, a combination of carbon fiber layup and fiber glass. It is essential that the removal process not damage the carbon fiber layer of the blade skin," said Ebert. Damage to the carbon fiber layer would ultimately condemn the blade and tag it unserviceable. Quality inspectors inspected the rotor blade upon completion of the Hontek removal process to evaluate any damage found under the erosion coating. Damage found at this stage had to be repaired in accordance with the H-60 Interactive Electronic Technical Manuals. Any damage beyond what is allowed by the IETM was recorded on an AED Maintenance Engineering Call form and submitted to AED for approval. Through AED approval of the MEC, the number of serviceable MRBs was much higher since repairs could be implemented per the approved AED MEC. Once all repairs were completed, the blades were painted, weighed, and static balanced on the Universal Static Balance Fixture, then sent through a final inspection where all required forms and documents were recorded in the Maintenance Consolidated Database Systems. In order to remove the Hontek-coated MRBs from the Black Hawk fleet as soon as possible without impacting the operational readiness of aviation units, contact teams were assembled and sent to every Army Black Hawk unit to replace the coated blades with standard H-60M rotor blades. The UHPMO coordinated with the units for aircraft availability, and the Pentagon set the unit priority and schedule for blade change out. The contact team conducted 21 trips touching 362 Aircraft. The project, which wrapped in October 2015, was very successful. "The mission of the PIF [is] rapid response to the Warfighter. We were able to do that [with this project]," said Waldran. While the rapid response effort was focused on HONTEK removal on the H-60M rotor blades, the legacy fleet of UH-60Ls also required attention to gain the same performance increases. 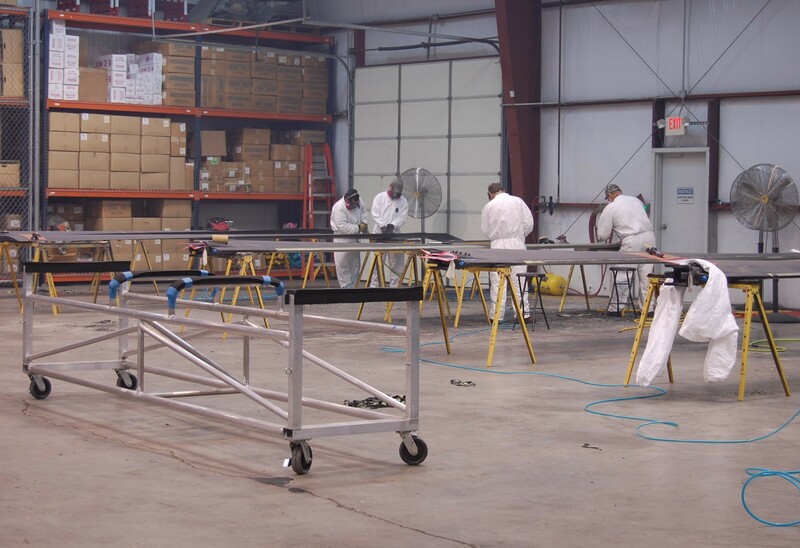 The team worked closely with the Corpus Christy Army Depot to share knowledge of tools and processes gained on the H-60M blades so that CCAD could affect the same improvements on the legacy fleet. The PIF had the equipment, tools, skilled technicians, and experience required to remove the Hontek coating, while CCAD had a dedicated blade repair facility. The logical solution for the legacy MRBs with the coating was to ship them to CCAD for repair. "The removal of the HONTEK erosion coating on the Army Black Hawk fleet is complete," said Ebert. "This was a win-win effort for the PIF, CCAD, and ultimately the Warfighter."